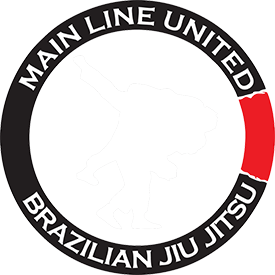 In my last post, I mentioned that jiu-jitsu was, in large part, about delivering or redirecting force. Every position, technique, or move has one or more important points of contact with the opponent or with the mat. It’s important to recognize where these important parts are, and to make sure that the point of contact delivers the proper force to the opponent (note that this force needs to come from somewhere….this post is just going to deal with the end-point of the force. I’ll talk about counterpressures/posting in a future post). In most cases, the end point of the force…the point where the energy generated by my body goes (that sounds mystical, but it’s not…I’m talking about pushing/pulling on something, not sending shoryukens flying at the opponent) is going to be the spot where I am connected to my opponent (or at least one of them). I need to make sure that none of the force I have generated through the technique “bleeds away” before being effectively delivered to the opponent. In the last post, I talked about using shelves in a kimura. As noted, this isn’t a position I use very often, but a few photos can be helpful in illustrating this. My shelf is good, I’ve got his elbow well controlled….but….something looks off……Let’s zoom in a little bit. My left wrist is cocked backwards. My hand..which is the final point of contact with Paul’s wrist…is allowing some of the force which will be generated by the movement of the rest of my body to bleed away. Without a solid wrist here, my hand will bend backwards and soften the pressure I am able to deliver. This makes the remainder of my technique in efficient in achieving its purpose, as if I threw a punch while wearing pillows on my hands. In addition to making this technique less effective, it also creates a weak point in the chain, which Paul may be able to take advantage of by simply pushing against the technique. Rather than attempting to resist a kimura, he is pushing against my wrist and fingers. 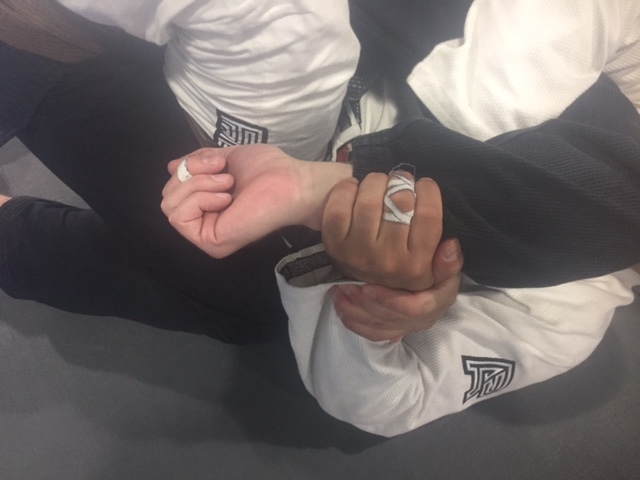 His resisting force doesn’t need to travel back down the chain of my technique, it just needs to push the wrist and fingers backwards until the discomfort prevents me from finishing. Here, the wrist continues the chain of my technique, delivering the force I’m generating directly into Paul’s arm. If Paul pushes back, he is pushing against the framework of my forearm, rather than the bend of my wrist. This makes the technique more efficient in delivering force to Paul, and more effective in breaking through his resistance. There’s a similar concept at play in the following two videos. One error I consistently see in people learning a new choke for the first time is illustrated here. In the first video, I try a basic baseball bat choke from knee on belly. Technique and mechanics look pretty much the same, but this time Paul is visibly affected by the choke even before I get fully around. Note my arms….the endpoints of the force delivered here. I am actively squeezing them together, to ensure that the rotational force I’m creating travels into its intended target (Paul’s neck). The whole purpose of everything I am doing in this technique is to deliver pressure to that vulnerable point, but the best mechanics won’t be helpful if it never arrives. 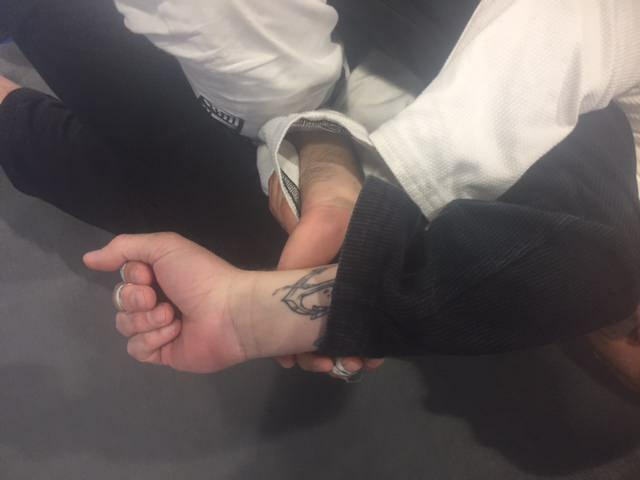 There are a host of other easy examples….think about the difference turning your wrist makes in an ankle lock, or holding the attacked arm against your chest rather than at arms length in an armbar. Don’t get so lost in the idea of creating power through a technique that you miss the point of it: Delivering it to a vulnerable spot on your opponent. I disliked my first attempt at a catchphrase. Now accepting nominations for a replacement.